Abhijit “Nannu” Nobis, founder and CEO of Nobis Engineering, will provide feedback to the Federal Reserve Bank of Boston on the regional economy from the perspective of a local business owner as a newly appointed member of the Federal Bank’s New England Advisory Council. The New England Advisory Council is a regional advisory board created to better inform members of the Federal Reserve about the issues impacting small- to mid-sized businesses in the region. The membership is made up of New England business leaders who represent a range of New England industries and organizations. Their task is to provide the Federal Reserve Bank of Boston with information about economic trends they see at their own organizations and industries, as well as share perspectives on business conditions in the region, including employment trends, capital spending, revenue forecasts and access to credit. Nobis’ two-year term will begin in March when he is scheduled to attend the New England Advisory Council quarterly meeting convened by the Boston Federal Reserve President and CEO, Eric S. Rosengren, at the Federal Reserve Bank in Boston. Nobis is one of nine prominent business leaders tapped to serve on the Council. Abhijit “Nannu” Nobis is a licensed engineer, and founder and CEO of Nobis Engineering, a multidisciplinary engineering consulting firm with offices in Concord, N.H., Lowell, Mass., and Naugatuck, Conn. Nobis Engineering serves private and governmental clients throughout the northeast and mid-Atlantic areas, providing specialized civil engineering, geotechnical engineering and environmental investigation, clean up and permitting services. 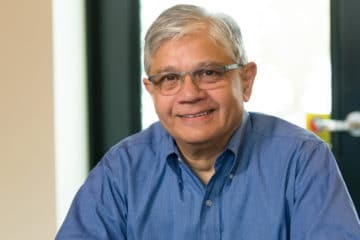 Nannu currently serves as a director of the American Council of Engineering Companies New Hampshire chapter, is the chairman of the board of directors of Granite United Way, and the past chairman of the Greater Concord Chamber of Commerce. Previously Nannu served as a former Trustee of New Hampshire Public Radio, and Director of Early Learning New Hampshire. In addition to his board duties, he frequently rolls up his sleeves to help with Habitat for Humanity, NH Food Bank and local community organizations. Nannu was recognized by the U.S. Small Business Administration as the 2012 New Hampshire Small Business Person of the Year and was recently selected by a jury of his peers from New Hampshire’s various engineering societies as the 2018 New Hampshire Engineer of the Year. Nannu received his bachelor’s degree in Civil Engineering from the Birla Institute of Technology and Science in Pilani, India, his Master of Science in Geotechnical Engineering from the University of Michigan at Ann Arbor and completed several executive management programs at Dartmouth’s Tuck School of Business in Hanover, New Hampshire.